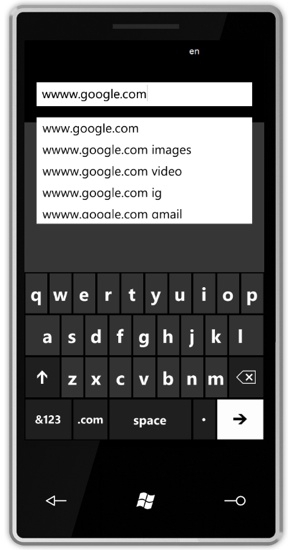 Should Microsoft Spend Time On Keyboard Sounds In Windows Phone 7? "Windows Phone 7 will feature eight click sounds that are subtly different from each other, and are just a bit quieter than the single click of Apple's iOS, reports Long Zheng. Each of Microsoft's clicks is "a slight variation from the one that comes before it, and they occur in a round-robin pattern," Matthew Bennett, senior sound and sensory designer for Windows Phone, said in a recent talk." OK, this "sounds" a little over the top, but indeed it seems like Microsoft has spent at least some time and effort on what one might consider a minor feature of their new smartphone operating system. Website seattlepi.com has posted an article referencing Microsoft's Matthew Bennett, who sports the title Senior Sound and Sensory Designer for Windows Phone, that suggests there are eight unique click sounds in play when you type on the Windows Phone 7 soft keyboard. "Why bother", you ask? Bennett claims that research has proven that sound can actually affect the touch sensory experience. This is something that we'll probably all have to try for ourselves to see if we perceive a difference, but it seems a little strange. Audio experts out there: will this make a big difference? Well, I am just imagining myself sitting in a train or an airplane and everybody beeping their keyboards around me..... distressing. I have a customer who has an Omnia 2 and has enable the screen touch sounds, and it disturbs anyone around. I guess that whoever has heard of keyboard vibration can easily give-up on keyboard sounds. The experience is a lot better than with sounds. Wander why iPhone/Android devices use it? Keyboard sounds are the first thing I turn off on any device with a soft keyboard. It's good to see such attention to detail (sounds rather Apple-esque), but like Heliod I worry that it comes at the expense of other details that will be left out. Like a previous poster I turn off keyboard noises on any device that has them. I think it's one of the most annoying "features" that's been developed over time. Sure, in some situations it may be a reasonable substitute for tactical feedback but in general, it's just annoying - and if it isn't for you it is for everyone around you. That's been my experience. "research has proven that sound can actually affect the touch sensory experience"
This is absolutely true, and an effect that I noticed way back when I first started using a mouse with Windows 3.0. It has to do with the efferent and afferent pathways in the human nervous system. The sound you hear (the click) is what you have learned to expect from pressing buttons, and causes your brain to send a signal to your fingers to expect a physical click. The nerves actually respond by sending back a signal that says "Yup, I felt something." This all happens back and forth almost instantaneously. I never claimed to know everything... I'm just right about the things I know! Apple-like for sure. My Apple Newton (1998) made a series of tones for screen taps. I turned that feature off. I think what's important to remember here is that there's a team of software developers working on the software keyboard (SIP); they have lists of features they wanted to include, had to prioritize, and ultimately finish the code. If they hadn't added the sounds, they'd have worked on something else related to the keyboard - it's not like they'd say "Hey, let's go work on the shell team so they can get copy and paste."